You are here: Home > Stories > How Old is that Tree? Everyone wants to know how old a particular tree might be. We will discuss this complicated and important subject in two stories. This month we will talk about unitary trees, and next month we will tackle the complex problem of aging clonal trees. A unitary tree is like a person - a single, integrated organism. Unitary trees have one or a few stems on a single root system. The stem is the same age as the root system. Most tree species are unitary, although some, such as oaks, beeches, and red maples, will create a new stem or a few stems when the original one is lost so that the root system is older than the stem.Clonal trees are colonies of many stems, sometimes thousands, on a single root system. The entire clone, including all the stems and the root system, is a single organism. Over time, some root connections may be lost and the tree no longer functions as a single organism, even though the separated parts are genetically the same as each other. Clonal trees are colonies of many stems, sometimes thousands, on a single root system. The entire clone, including all the stems and the root system, is a single organism. Over time, some root connections may be lost and the tree no longer functions as a single organism, even though the separated parts are genetically the same as each other. 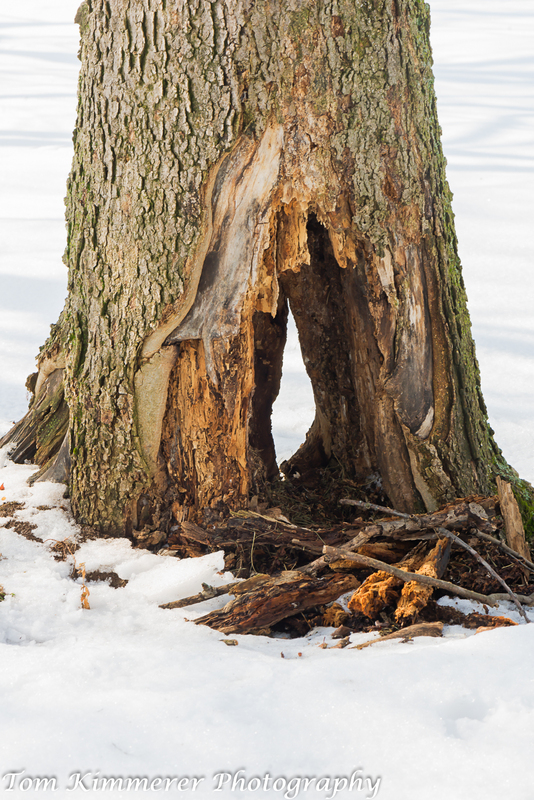 As most of us know, trees in temperate climates generally produce a single ring of wood each year, growing fast in the spring, slowing down in the summer and producing a distinct ring. It should be a simple matter, then, to count the rings and find out the age of the tree. We can do this either by cutting the tree down or by taking an increment core, a narrow cylinder of wood from the bark to the pith at the center of the tree. This is not as simple as it sounds. Obviously, we don't want to cut down ancient trees unless they are dead or in danger of falling and doing harm. Increment cores are very labor intensive both to obtain the wood sample and to prepare the sample and count the rings. Very large trees like our bur oaks are extremely difficult to core. 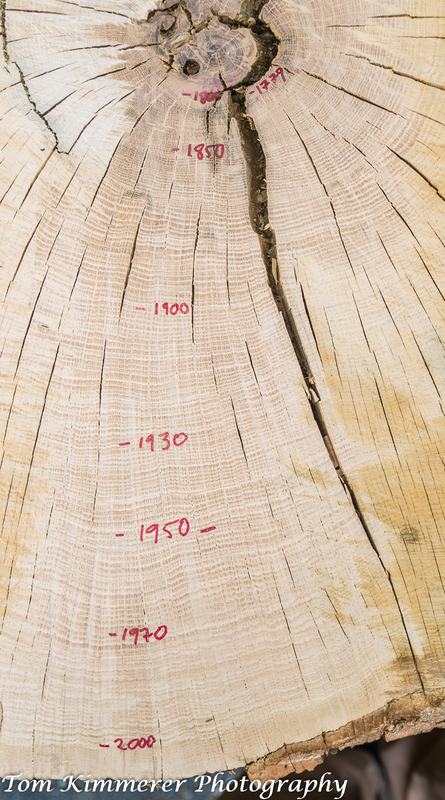 Determining the age of an old tree by carefully counting and cross-dating the rings using valid methods, followed by publication of the results in a peer-reviewed journal is the gold standard for determining and confirming the age of a tree. On that basis, the oldest known tree in the world is a bristlecone pine, Pinus longaeva, originally collected by Ed Schulman in the 1950s but only analyzed by Tom Harlan in the past couple of years. This tree, now 5065 years old is still alive and growing well in the White Mountains of California. Understandably, its location is kept secret. This tree is accepted as the oldest unitary tree known in the world. In the Bluegrass and Nashville Basin, the majority of our very old trees are hollow. You can't count the rings in a hollow tree unless you take a sample above the hollow part, and then you may miss many years of growth. In Europe and Asia, the age of very old trees may be known from historical records, such as the date a yew tree was planted in a churchyard, or a sacred bodhi tree was planted at a temple. We rarely have that luxury in North America with its very short written history. A number of trees planted by Thomas Jefferson, William Bartram and other botanists and enthusiasts survive today and we can date them precisely. William Bartram planted a yellowwood (Cladrastis kentukea) at his garden in Philadelphia in 1805. Badly damaged by a wind storm in 2010, the tree recovered and is thriving today at age 210. Any other method of determining the age of a tree is very imprecise. The relationship between tree size and age, especially in our open-grown hardwoods, is not a strong one. 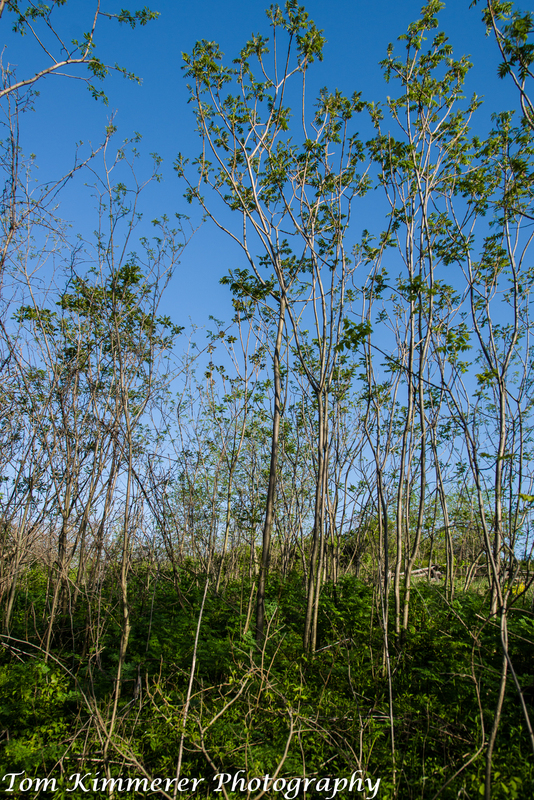 Trees growing slowly in poor conditions often outlive trees in better conditions. Over time, a number of biologists have developed criteria to assess whether a tree is very old. Neil Pederson summarized the most important characteristics of very old hardwood trees: 1) balding bark - bark smoother than younger trees of the same species; 2) low stem taper - the main stem is cylindrical, not narrowing with height; 3) sinuous, winding stems and branches; 4) crowns with few, very large and twisting branches; 5) low crown volume relative to the stem diameter; 6) low leaf area to trunk ratio. 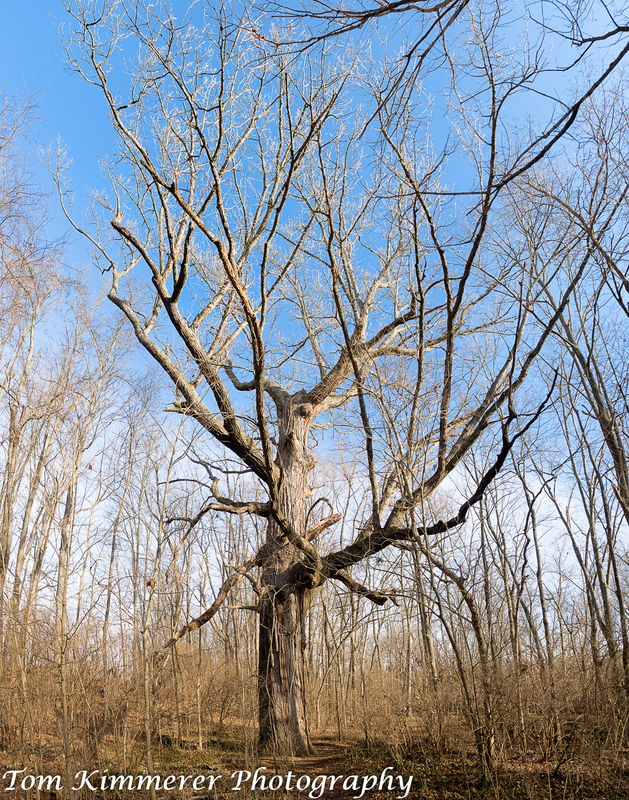 For the ancient trees of the Bluegrass and Nashville Basin, two additional characteristics are 7) leaves tufted at the ends of branches; and 8) main stem rarely present, with the top of the tree damaged and decayed. While these sound complicated and difficult to analyze, with a little bit of practice, it is not difficult to separate our oldest trees from younger ones. Using these criteria and a knowledge of the terrain and land use history, we can usually sort our trees into categories. For example, an extremely large bur oak growing at the top of a slope that shows the above characteristics was probably growing before the area was settled. That would make it somewhere in the range of 300-500 years old, possibly older (we have found some older trees but have not yet published the data). A bur oak of similar size, growing along a creek with good access to water and showing fewer of the old-tree characteristics may be half the age of the one at the top of the hill. I know this answer frustrates a lot of people anxious to know the age of their favorite trees, but the plain answer to "how old is my tree?" is usually "I don't know but I think it is several hundred years old. Based on the limited scientific evidence that we have, plus some historical data, I am often comfortable saying that our biggest old trees are "probably 300-500 years old, maybe older." And as to all the claims of the great age of trees that we see on the Internet, we should treat them with a great deal of skepticism. That 6,000-year-old baobab? It might be 1,000 years old. The Angel Oak said to be 1,500 years old? More likely to be 400-500 years old. These trees are still very old and deserving of our respect and veneration, and there is really no good reason for people to make such wild claims. And what about that 9,000-year-old spruce called Old Tjikko, the subject of thousands of Facebook claims and blog posts? As we will see in our next story on old trees, that claim does not hold up either. A chinkapin oak that was growing in Lexington before 1779. This is at 14' off the ground because the base was hollow. Hollow trees cannot be aged with accuracy. Hackberry. Posted in News, Tree Biology and tagged age, dendrochronology, Trees, Venerable Trees.